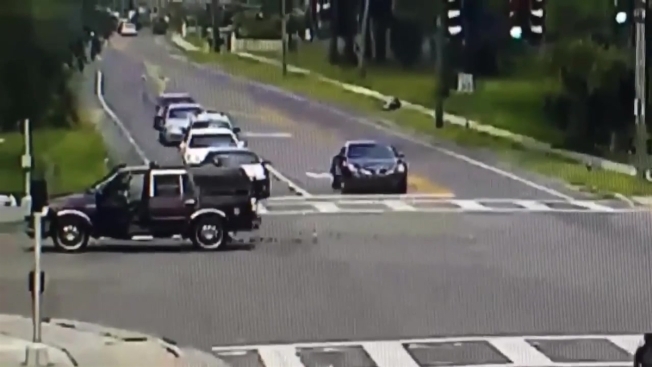 Video captured Monday afternoon shows a woman falling out of an SUV as it moves through a busy intersection near Tampa. The Hillsborough County Sheriff’s Office released video on social media in which the vehicle can be seen in motion while what appears to be an unconscious person falls out. The driver of the vehicle is then seen stopping the SUV, picking up the woman and putting her back inside before driving away. Officials told NBC affiliate WFLA-TV the vehicle was found Tuesday morning at a gas station not far from the intersection, but didn’t say if either the woman or the driver was found at the same time. Numerous cars were at the intersection and there were several people walking and biking along the sidewalk at the time. Sheriff's spokesman Danny Alvarez said investigators canvassed the area and checked with all local hospitals looking for the woman.